SIGNS YOU MIGHT HAVE TERMITES! Whether you have just bought your dream home, have an investment property or you’ve been in your home for a lifetime it is important to always have termite’s inspection done on your property. Inspections by Australian Standards is every twelve months or if you are in a bushy area than inspections are every six months. In between inspections there are little inspection routines you can do to reduce the risk of termites making your home their new home. What are steps that you can do in or around your home to reduce the risk factor of termites eating through your biggest investment. Do mini inspections and check for any changes in and around your home. Go around your premises and remove any timber landscaping post and sleepers. Remove timbers and other debris that are in your subfloor. Fix any leaking pipes in and around your home. Remove any wood chippings in your landscaping area. If you have a section for firewood or untreated timber I highly recommend that the firewood and untreated timber be removed from your premises. Divert any water sources away from your home. Reduce humidity in your subfloor by installing a crossflow ventilation fan. Pruning of bushes and heavy foliage around your home. Get a ladder and check your gutters and remove any debris that maybe in your gutters. Remove any dead tree stumps or old diseased trees from your premises. Make sure that any water overflow pipes and air-conditioning pipes are directed away from your home. Remove any moisture in and around your home, there are special machines such as a dehumidifier that works great. Replace or repair damage shingles, fascia, and soffits. Please note that if you have found termites do not disturb them as by disturbing the termites will cause the termites to move underground and pop up in a new location in your home making it harder for the termite technician to ascertain how bad the termite infestation is in your home and possibly won’t be able to get a termite colony. What are some of the signs that you can look out for when It comes to termites in and around your home? Mud leads protruding through fibro, gyprock, and other timbres in and around your home. Blistering of paint or plaster from your walls or ceiling. Mud tunnels coming from subfloors up the through cracks and crevices. Floors and ceilings are sagging. Timbers appear to be hollow. Fine dust where there is wood panelling. Termite mounds that appear to look like ant mounds. Decaying trees that have been eaten by termites. 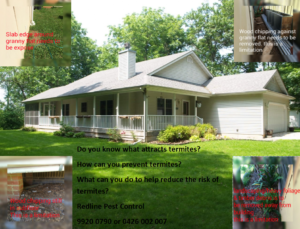 What does Redline Pest Control do when carrying out a termite inspection on your home? When a Redline Pest Control comes to your home he will spend some time with you asking you questions before he carries out the inspection. 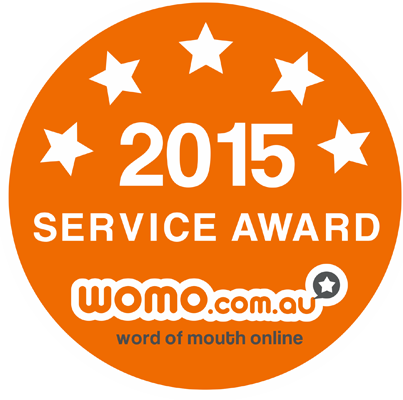 Communication is very vital for us as we love to build a report with our clients. A termite inspection is a visual inspection for evidence of wood-destroying insects such as termites or could even be borers. 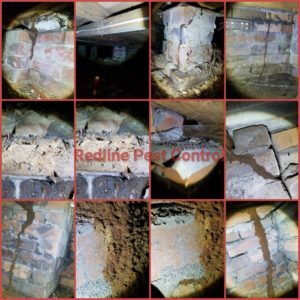 Redline Pest Control technician will visually inspect your entire your home including entering any sub-floors, basements and roof voids and external perimeter of your property. The average time it would take to perform a termite inspection is approximately one to two hours depending on the size of your premises. Can termites still active in colder climates? Yes, termites are still active in cold weather, it does not kill them but it does slow them down. Could there be hidden termite damage to my property? Yes, one of the main characteristics of termites is their ability to avoid bright lights and open air. This means they will stay underground or within wood products as open air and light will kill them. Unfortunately, it is impossible for a Redline Pest Control technician to visually identify or locate any active termites just by looking around your property. Your Redline Pest Control technician will go around your premises with a donger and will tap all timbers, door jams, skirting boards, and architraves to listen out for any hollowness or if it breaks away due to termites. Each time a Redline Pest Control technician taps these surfaces he will hear noises and will be able to ascertain just by sound if there is something behind where he taps. Redline Pest Control will use other devices to ensure that we get the most out of your termite inspection. Moisture meters will determine if there are high levels of moisture behind wall cavities. 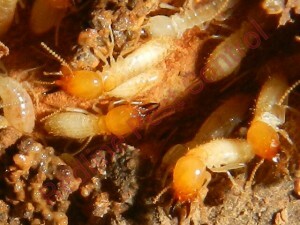 Unfortunately, when you have termites they will bring moisture to any wood which is behind your walls or windowsills. 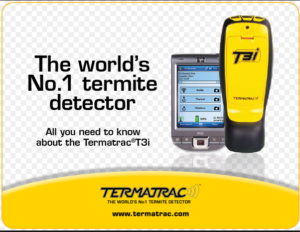 Termatrac T3i is a machine your technician will use in your home when conducting a termite inspection. Your Redline Pest Control technician pairs the Termatrac T3i with his phone and will place the Termatrac T3i to the surface of walls to ascertain whether there is activity behind the wall. If there is activity behind the wall the Termatrac T3i will indicate this by the increase of heat and humidity in that area. Once the Termatrac T3i has picked up the heat and moisture he will than press a button on his device which will switch over to radar mode which will then show a graph with the level of activity of any termite’s present. Once your termite inspection has been completed your technician will advise you of any termites found or what you could do to reduce the risk of termites in and around your home. Your technician will come back to the office and prepare your report with any quotes to either eradicate termites or by installing a termite prevention barrier to your premises. Is your home protected from Termites?